Fundamentally, copyright compliance is about honoring the creators of our music and helping them make their living from their music so that they can make more of it for us. Whether your chorus is performing a free community concert or in a ticketed venue, if you are performing copyrighted music you are legally (and morally) responsible to pay the composer and those institutions that support the work of composers. Here’s a concise summary of copyright information by Kristan Burkert- The Legal Side of Choral Music. Tresona has provided us an excellent and very readable copyright guide. No piece of music may be arranged and performed by a chorus without permission from the copyright holder – unless it is in the public domain. Always make sure you have this permission in writing and that is carefully stored with your music library and on file in your chorus files. It can cost anywhere from $100 and up for a license to arrange depending on the length of the song and who owns the copyright. Some copyright holders will give permission without cost but you need to ask and get this permission in writing. Sheet Music Plus has a new program called ArrangeMe that allows composers to upload arrangements for purchase. SMP takes care of all the copyright detail. To request other arrangement licenses, contact Tresona. Tresona is a for-profit entity and their fee will be included in the prices quoted for licenses. Choruses may not reproduce copyrighted music in any form without written permission from the copyright holder. Period. How do you know if a piece of music is under copyright? Music and lyrics published before 1922 may be in the public domain. Here are some resources on Public Domain and Royalty-Free Music in the United States. 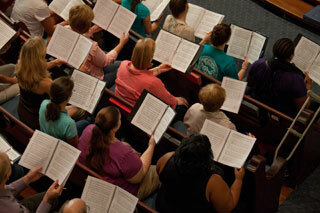 Every GALA chorus is also responsible to pay license fees for each performance that you produce. These fees are based on ticket sales and venue size and go directly to support the composer and the publishers. Most choirs pay an annual blanket fee which covers all these licenses. In the US, the two companies that you need to contract with are ASCAP and BMI. Composers are paid by these licensing companies. If you record copyrighted songs you must obtain a mechanical license. These two companies can assist in obtaining mechanical rights. Harry Fox offers an on-line SongFile that may used if you are producing 2500 or fewer copies of a recording. Tresona has been working with GALA member choruses to assist with recording licenses and permission to arrange. A number of GALA choruses are now selling their recordings for download through Tresona which also will make the arrangements to get these recordings out on web distributors such as CD Baby and Amazon. Want to post your concerts or individual songs on YouTube? Tresona can help your chorus negotiate these rights. Performing a staged version of a musical or opera—or selections from a musical or opera—may involve securing "Grand Rights." Grand rights is a legal and business term which refers to the permissions necessary to stage an opera, play with music, or a work of musical theater. Performance rights organizations such as BMI and ASCAP do not license grand rights in the United States. Grand rights must be negotiated between the producer of a production and the publishers and owners of the copyright of the work. Typically a royalty will be paid to the publishers and owners of a work in exchange for the permission and right to stage the work. A dramatic performance shall include, but not be limited to, a performance of a dramatico-musical work (including a musical comedy, opera, play with music, revue, or ballet) in its entirety; or, performance of one or more compositions from a dramatico-musical work accompanied by dialogue, pantomime, dance, stage action, or visual representation of the work from which the music is taken. Explore the issue of Grand Rights more deeply with this article from the New Music Box. This powerpoint presentation contains some helpful examples of what is considered a "dramatic performance." A chart detailing what is and isn't in Public Domain in the US. You can use it on the Web, or print out a PDF file.